This story came to us from FASF Aviation News Scout Jerry Dixon (Retired USMC Pilot) of El Paso, TX. It can be found on the website “B-29’s Over Korea” and was authored by Wayland Mayo. The two short videos below provide some more visual background to this strange tale. The B-29 was the most expensive weapon of WWII – more costly than even the Atomic Bomb, and it was this Superfortress B-29 that was used to drop the first two bombs on Japan, which bombings caused the Japanese to surrender – ending the long and devastating world war. The following video about the B-29/TU-4 story is only 1:43 long, but the second slightly longer video (4:03), also below, pretty much gives a more complete story . . . Probably the most significant development in aviation history is one which most Americans don’t even know happened. We worked hard to get our B-29 built so we could reach Japan, the retaliation that President Roosevelt so badly wanted. The Russians also wanted and badly needed a long range bomber as much as we did. The difference is, we engineered ours with ingenuity and perseverance, the Russians stole it. Read this fascinating story and you will find it hard to believe, but it actually happened. The B-29 is now as much a part of Russian aviation history as it is to American aviation history. After the Japanese bombing of Pearl Harbor, President Roosevelt had a burning desire to retaliate by bombing Japan. This soon became an obsession with him, but how were we going to accomplish this seemingly impossible feat? The only long range bomber in our arsenal was the B-17, and the idea of reaching Japan became increasingly remote. We needed a Super Bomber, but did not even have one on the drawing board. Roosevelt fortunately had a solution to his problem, with time almost ruling out such an undertaking. His solution was Gen. H.H. Arnold, better known as “HAP”. Gen. Arnold was already pushing for a more sophisticated Air Force with long range capability. He sent a request to all the aircraft companies seeking designs for a Super Bomber. Boeing had been working on such a design and won the contract. They were to deliver two flying prototypes by 1942. It was to be the fastest, largest, heaviest plane ever mass produced. The U.S. ordered 250 sight unseen. Then Germany attacked Russia. The number was increased to 500 planes. On Sept. 21st, 1942, the Boeing XB flew out of the Seattle plant. This three billion dollar gamble was the largest government commitment ever to a single project, including the Atomic Bomb. There were residual benefits to this contract. It brought the country together. Boeing had four assembly plants, and hundreds of smaller plants making sub-assemblies. 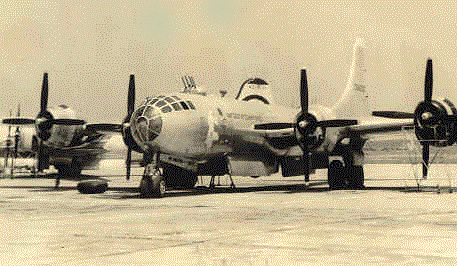 Finally in 1943 the first production model B-29 rolled out of the Wichita plant. Eventually over 4000 were produced, 1600 at the Wichita plant which employed 26,000 workers working seven days a week. The first bombers were sent to the CBI area (China, Burma, India). Gen. Arnold realized we needed a place for damaged planes to land after bombing Japan. Roosevelt asked Stalin for permission to land in Siberia or Russia. Stalin evaded answering the request. Russia was not at war with Japan, and had their hands full fighting the Germans. They did not want to open up another front by taking on Japan. Our crews were told that after bombing Japan, only in an extreme emergency, to land in Vladivostok, Russia. On August 20, 1944, a B-29 was forced to divert to the Soviet Union. It crashed east of Khabarovsk after the crew baled out. The crew was interned in Russia. About the same time three B-29’s with emergencies landed in Vladivostok. One of the planes was the “Ramp Tramp”, another was the “Ding Hao”. Ironically the third plane was completely intact was the Gen. H.H. Arnold Special! The crews assumed the planes would be refueled and they would return to China. They were never to see their planes again. The crews and aircraft were all interned. Now the Russians were holding four crews and three complete B-29’s. Desperate negotiations by the U.S. for the release of the crews and the aircraft were ignored. Stalin was continually pressured for the release of the crews and planes, however it soon became obvious that he had no intentions of giving them up. He decided to steal them. He figured it would take over five years to design and build their own much needed long range bomber. A better way would be to steal these already in his possession and make a bolt for bolt exact copy of them. Stalin demanded the reproductions be ready in two years. The entire Soviet aircraft industry was mobilized to meet this seemingly impossible deadline. At that time any dissension was met with punishment, even death. That would be considered sabotage to question a project. This project received top priority. The Russians were completely dumbfounded when faced with the enormity of the situation. They were fascinated with the gigantic “Silver Bullet”. What better luck than to have three of them dropped right in their back yard. Finally through some bizarre diplomatic negotiations between the US and Molotov it was arranged for the aircrews to “escape” to Tashkent, Russia, via the Trans-Siberian Railroad. They were given adequate treatment while interned. From Tashkent they were transported by train and truck to Tehran, Iran, for their release. However their release wasn’t going to be that simple. They were warned not to talk to anyone, and had to sign top secret documents swearing them to secrecy. They were flown to Naples, Italy, and then shipped to N.Y. where they finally found freedom. The Russian plan was to organize the best pilots, technicians, engineers, and aviation specialist to measure and catalog each of the 105,000 parts of the B-29. They decided to completely disassemble the Hap Arnold Special and use it for measurements. The Ding Hao would serve as a reference model, and the Ramp Tramp would be used for pilot training. Russian pilots would have a hard time figuring out the significance of the instruments, so their top pilot, fluent in English, labeled every instrument in Russian so their pilots could easily identify everything required to fly the B-29. The Russians were amazed at the quality of the workmanship and the technology involved in the manufacture of the B-29. The Soviet version would be called the TU-4, NATO code name “BULL”. After the Hap Arnold Special was completely dismantled they immediately realized the almost impossible task of “reverse engineering” the aircraft. It has been reported the Russians only had slide rules and even some used an abacus. All measurements had to be converted to metric sizes. Now they were running into major problems. Imagine the complexity of copying the giant R-3350 engine. They were not able to manufacture the wing fuel tanks. The compound curves of the plexiglass nose presented an unsolved problem, and pilots complained about distortion in the Russian copy. They did not have the capability to manufacture the huge tires. The massive landing gear also was a problem. The responsibility of copying the air frame went to Tupolev. There were miles of wires, and the sophisticated gunnery system presented the biggest problem. The Russians sent agents to the U.S. to try to purchase anything they could find in parts, plans, tires, or information pertaining to the B-29. The machine guns were replaced with cannons. The copying and manufacture of the R-3350 engine was turned over to Shvetsov. The TU-4 project was well underway early in 1945. An increase in quality control and sheer perseverance moved things along. The end of the war with Japan made no difference in the production effort. It was full speed ahead. The U.S. had previously not believed the Russians had the capability to clone the B-29, it seemed totally inconceivable. The public Russian debut in the Aviation Day parade in 1947 changed their minds. The U.S. found itself in a panic situation when they learned the TU-4 was indeed a reality, capable of hitting any target in the U.S. There were reports of “one way” missions by hundreds of TU-4s carrying nuclear bombs attacking the U.S. This forced the U.S. to beef up their Radar systems, surface to air missiles, and interceptor jet fighters. Meanwhile, back in the Soviet Union, problems continued to plague the TU-4 project. The advanced avionics of the central fire control gunnery system remained unsolved. There were problems with the pressurization system, and the R-3350 copy was overheating, had short engine life, runaway props, and in general these serious problems led to the total unreliability of the entire aircraft. The Russians toiled endlessly on solving these problems, and it was not until 1949 that the TU-4 became fully operational with some 300 in service. The TU-4 never saw combat. Some 850 were eventually produced. Before the 60’s arrived the TU-4 had been replaced by jet aircraft. A few were given to China, and there are reports these were kept flying as late as 1968. The Ramp Tramp and the Ding Hao were scrapped. The Hap Arnold Special was never put back together. The B-29 brought our country together, and made us a proud nation. The TU-4 became as much a part of Russian aviation history as the B-29 was to American history. As far as we know the only remaining TU-4 is displayed at the Yuri Gagarin Air Force Academy outside Moscow. This story, as incredible as it seems, is all true. Just another page in aviation history. This entry was posted in AVIATION NEWS on November 17, 2016 by FASFRIC.